November 22, 2016, 2:23 PM · Lately historians, musicians and music-lovers have been uncovering more about the lives and works of women whose careers flourished at the same time as Beethoven, Mendelssohn and Brahms -- but were left out of the history books. 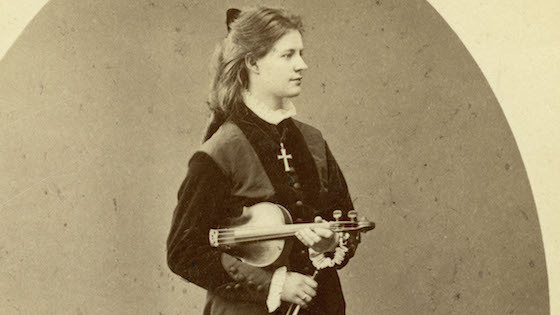 Over the last few years on Violinist.com, we have looked at the lives of female violinists such Maud Powell, Wilma Neruda, Leonora Jackson and more. 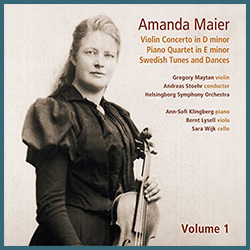 Now comes a new recording of works by the brilliant 19th c. Swedish violinist Amanda Maier-Röntgen (1853-1894) (called Amanda Maier, Vol. 1). Maier was the first female graduate in conducting from the Royal College of Music in Stockholm. She composed and premiered several major pieces and also toured as a violinist before marrying her violin teacher's son Julius Röntgen (1855–1932). Her concertizing stopped after her marriage; she had two children and died at age 41. The new recording, by Swedish-born Michigan-based violinist Gregory Maytan, includes the world-premiere recording her violin concerto, written at age 22, for which there is only one movement, the last two movements having been lost. It also includes her previously unrecorded Piano Quartet and Swedish Tunes & Dances. This is the second time her name has emerged this year -- Milwaukee Symphony concertmaster Frank Almond also recorded a sonata by Amanda Maier Röntgen in his latest album, A Violin's Life, Vol. 2. 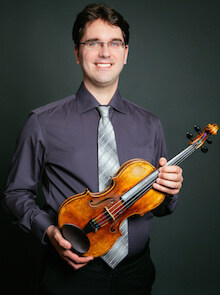 Maytan, who studied with Miriam Fried and Paul Biss and has a doctoral degree from Indiana University, is an Associate Professor of violin at Grand Valley State University in Michigan. I spoke with Maytan via e-mail about what made him seek out this music and why it has held his interest. Laurie: How did you first discover Amanda Maier-Röntgen and her works? Gregory: I was introduced to her work when I was 14. My teacher, who had a special interest in female composers, gave me the Maier sonata to learn. Needless to say, I had never heard of Maier before, and I soon discovered that there was only one recording total available of her work! Many years later, when I recorded my first CD, Scandinavia I decided to feature that sonata. My pianist loved the work, and the reviews from the Strad, Strings Magazine, the American Record Guide were all very enthusiastic, specially about Maier (the Strad called it 'the real discovery'). This positive, and somewhat unexpected response made me interested in recording more of her works. I discovered an old edition of her six pieces for violin and piano, and recorded them on my second CD, Scandinavia 2 . A few years later, when my university sabbatical was coming up, and as I was starting to brainstorm about possible projects, it came to my attention that a violin concerto by Maier had recently been discovered and published. I ordered the music, and a friend in Sweden put me in touch with the manager of dB Productions, a Swedish record label specializing in neglected Swedish music. The Helsingborg Symphony Orchestra expressed interest in being the first orchestra to record the work, and so the idea for the CD was born. The manager also informed be about a piano quartet that had never been recorded, and I mentioned to him that I had learned about a series of dances for violin and piano. All of this led to the CD of previously unrecorded works by Maier being recorded. I found that these works had considerable musical merit, and deserved to be heard by a wider audience. It is not often one comes across great music from the 19th century that is completely unknown! In a way, recording this CD feels like my small contribution to the world of music. Laurie: Did you have to unearth her works in a library, or were they published and easy to find? If another violinist wants to play these works, how can he or she find the music? Gregory: The piano quartet was found at the Royal Music Library in Stockholm, and the dances, believe it or not, were found on IMSLP! The concerto was just published by the Swedish Royal Academy a few months before the recording. I've also done my own edition of the six pieces for violin and piano. All of the above editions can be found on IMSLP and the website of the Swedish Royal Academy and can be downloaded for free. Laurie: You’ve mentioned that Amanda Maier had friendships with other famous musicians and composers of her day, can you tell me a little about those? Gregory: Absolutely! She was highly admired by the likes of Brahms, Grieg, Joachim and Rubinstein. There are numerous letters between Maier and Brahms where they express much mutual admiration. We also know they enjoyed playing chamber music together. Brahms even sent an early version of his third violin sonata to Maier for her advice. Maier also developed a friendship with Grieg through the Scandinavian Society, and was actually visiting him in Bergen, Norway when she wrote her piano quartet. Grieg was said to have been a big admirer of Maier's talent and person. Laurie: How does her violin concerto compare to others, where would you place it in terms of genre, and also technical difficulty? Gregory: You find a lot of direct influence by Beethoven and Mendelssohn in her concerto. At times, you may even feel like you are hearing direct quotations. I would personally consider it to be of a similar technical difficulty as the Mendelssohn concerto. It is not a virtuoso piece like the concertos of Paganini and Tchaikovsky, but one where the violin and the orchestra are equal musical partners in the vein of Beethoven and Brahms. Laurie: I see this is “Volume 1” - is there more to come? Gregory: That was the producers choice! As far as I know, I have recorded the complete violin music by Maier that we know about. I think the producer is planning on a second volume that will contain a piano work as well as some songs. However, I don't know for sure! Laurie: Do you have any advice for musicians who are seeking to re-discover music from a certain period or composer, as you have done? Gregory: There is much music that remains virtually unknown from all eras and styles. Part of the joy of being a musician is to play pieces from the great canon of established masterworks. It is also being able to discover lesser known works that you believe in and which you can become a kind of ambassador for. Of course, we love playing the great composers, and we should continue to do so. At the same time, I would like to encourage musicians to uncover similar hidden musical treasures, such as I believe Amanda Maier to be. I do think there is much great music that we have never heard. It is just a matter of doing some research, finding something you love and then performing and recording it!